They are very comfortable and fit as expected. 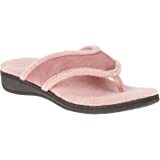 They fit perfectly and are very comfortable and reasonably priced. 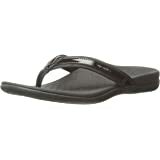 I have a pair of this brands flip-flops and they fit the same way and are just as comfortable but much warmer. Trust the Adilyn slipper to define comfort for you. Trust the Adilyn slipper to define comfort for you. 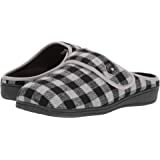 Slip-on style with hook-and-loop closure. Soft quilted upper. Orthaheel® technology. Non-marking and podiatrist design sole. Imported. Measurements: Weight: 9 oz Product measurements were taken using size 8, width M. Please note that measurements may vary by size. Weight of footwear is based on a single item, not a pair. I am a nurse with severe plantar fasciitis. 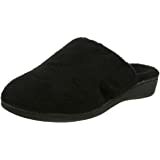 I have bought several pairs of slippers that I wear at all times around the house because everytime my heel hits the bare floor, I am reminded of what years of bad shoes and hard floors have done to my feet. These were delivered yesterday and as soon as I got home from work, I started wearing them. I have not had any miraculous overnight recovery, but for the first time in a long while, I am able to get up from a sitting position without a pep talk. I ordered my regular shoe size, tightened them with the adjustable Velcro, and they fit fine. 5.0 out of 5 starsWish Vionic shoe sizes were consistent! I do read the ratings on ALL Vionic shoes. The sizes aren't consistent. Sadly! I have work shoes that are a size 9, tennis shoes that are 8 1/2 and these slippers and sandals that are an 8. Since I broke my foot last summer doctor recommended these because of the high arch! I Really do Love them. My feet Loves them as well! These are a wider slipper, so if you have a narrow foot, I don't think they'd work for you!! This is a very comfortable slipper. When I took these slippers out of the box, I was unsure if they would be comfortable because where the sole of the foot goes feels hard to the touch. However, when I put them on, I didn't want to take them off. 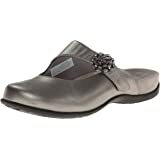 They orthotic provides great support, and I have a natural arch in my foot and don't wear orthotics. 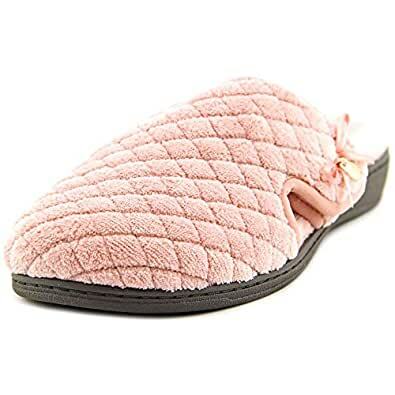 The sole of the slipper is also very durable and helps with quick trips outside. I found these slippers to fit as expected. 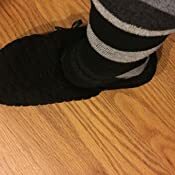 I wear a size 7 dress shoe (EU 38) and ordered the size 7 BM US slipper. 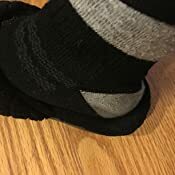 I've included pictures so you see where my heel is (gray sock) against the black slipper. For those who want more room off the back of the foot, then you'd need to go up a size, but I was happy with this fit. 3.0 out of 5 starsGame Changer for Plantar Faciitis, but do not wear well! After several years of inaccurate advice from my "old" foot doctor and recent surgery with my new dr. for morton's neuroma, I discovered that I have almost everything wrong with feet that can be wrong.... PF, tendonitis and tendinopathy, 2 morton's neuromas, damaged achilles, bone spurs and nerve swelling around my ankle, I was finally told that I could no longer go barefoot around the house, Very high arch was the biggest culprit, so I needed something adjustable. I almost always wear a 7 1/2, so I gambled and ordered a size 7. Couldn't have worn an 8. There is plenty of room to accommodate my arch, and the velcro makes that adjustment. 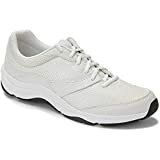 The heal is incredibly padded and the arch support is very good. Plenty of room in the toe box and oh so comfy, that I don't even miss going barefoot. These are a big part of my healing process. 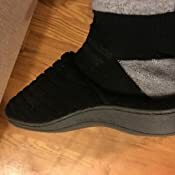 I would say that if you have a narrow foot, the toe box might be too roomy as I still think I could accommodate a relatively thick pair of socks and still be comfy. If I don't have on my orthopedic shoes, I have these on! ****Edited after wear - Although I loved these slippers, they did not wear well. The fabric next to the heal did not hold up and is just about worn through even though they only had a few months wear. So, good deal if you can afford to replace them every 3 months. Not a good deal due to price and length of wear... So sad because I really liked these! 4.0 out of 5 starsIf you're Nike size 9, order a size 8. I normally wear a regular width size 9 in Nike tennis shoes. I wear size 9 in Reef flip flops. 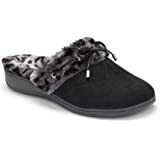 Unfortunately, the reviews on these vionic adilyn womens orthotic support slippers are all over the place, so I am hoping my review will help. Some people wear shoes that are too big for them. I like my shoes to fit correctly. For example, I don't like to have half an inch of extra space on the back of my flip flops, but I don't want my heel on the edge of the flip flop either (nothing hanging over). I like my feet to fit on the flip flop. 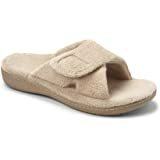 I ordered a size 9 in these Vionic Adilyn Womens Orthotic Support Slippers and they were way too big. My foot has a good 3/4 inch on the back of my heel when my toes are at the front of the shoe and about 1/2 inch space on one side of my foot, so they are pretty wide. I like that the arch is pretty high, this keeps the pressure off your heel, but since my foot slid all over the place in the size 9, my foot will constantly land on different spots of the shoe bed. I'm returning the 9 and buying a size 8. I'm hoping the smaller size will be more narrow as well. These shoes are not true to size, unless you're a person that typically wears shoes/flip flops that are loose and too big for your feet. 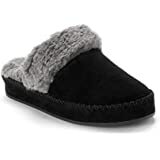 I really like the slippers, but I have never bought this brand of slippers and relied heavily on the reviews from other people on Amazon. 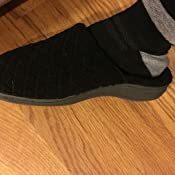 With that said, I always wear a women's size 9 in Every shoe, but everyone on the Amazin reviews for this slipper said they run so big and wide so definitely go a size down, so I ordered a size 8, when the came in they were too small, so I contacted the company and unfortunately they don't do exchanges, you have to return the one you don't want and reorder, the problem with that is the shipping costs. 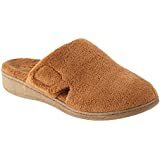 I had to pay for the 1st shipment of $9.99 to get the size 8 shoe, return it paying $12 shipping and reordering the right size 9, which was an additional $9.99 shipping, so all in all a $35 dollar pair of slippers ended up costing $65 :-( Moral of this story, these slippers fit "true to size", don't buy a smaller shoe listening to previous reviews. 5.0 out of 5 starsGreat support. Get a size smaller. I got them yesterday and have had them on ever since. I wear a size 6 - 6 1/2. Based on reviews I went down a size and ordered a 5. The fit is perfect. I would definitely recommend going down a size. These were purchased as a gift for my 85 year old mother in law and she says she loves them. I also own the same shoe and love mine as well. I recently discovered the Vionic shoes and been slowly replacing most of my shoe wardrobe. Wonderful support and comfort. I own about seven pairs now.